This was when my first Facebook Live series – Holi-daily – was born. I had so much fun going live that week, and I connected with people who ended up becoming clients. 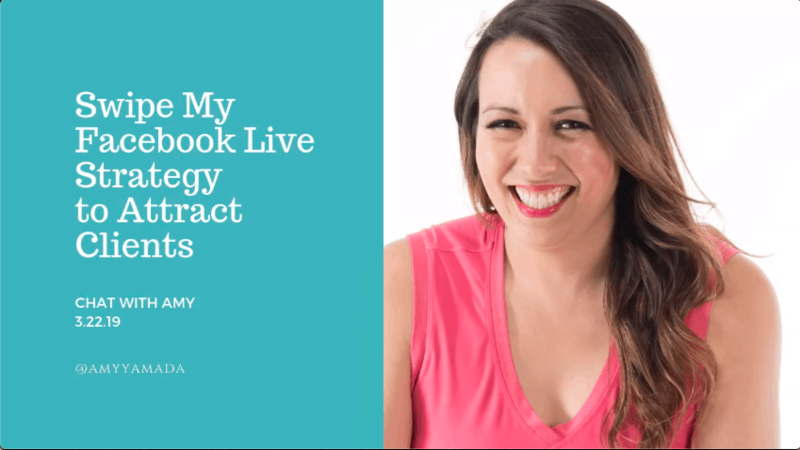 Needless to say, I was hooked to Facebook Live and I’ve made it a part of my marketing strategy ever since. Today, I’m sharing the 3 steps you need to walk through to get started with your very own show! How often do you want to have your show? And just decide to start. The sooner the better. If you put it off, you’re not going to be any more ready later. Trust me. Then I recommend that you decide your topics an advance on a monthly basis at a minimum. That way when you go to start your live broadcast, you already know what you’ll be talking about. All of my topics are based on my 3 core message marketing message elements – create, connect, offer. If you want support with creating your message, check out the resource at the bottom of this blog. Once you have your show ready to go, it’s super important to promote what you’re up to so people can join live. Don’t worry, if you are just starting off and have a small audience you may not have many people on live, but promoting is crucial anyway! You will get replay viewers. My team and I promote my show via my email list and through social media posts. This tip is a total gold nugget. After you create video content, I recommend you purpose it into written content on your social media channels and blog. A tool I recommend to help with that is Temi – Temi transcribes the video super quick and makes it easier to create a written post! You can also edit and post the videos to YouTube! There are so many possibilities to maximize the mileage of your Facebook Lives to amplify your message. I created a workbook to get you clear on your unique marketing message. No matter what level you’re at in business, this book will make a huge difference for you.